drivingandlife: Volkswagen CC - Class Coupe? Volkswagen CC - Class Coupe? Designed in Wolfsburg by Oliver Stefan the CC is a great re-imagination of the basic Passat sedan. It’s lower, slightly narrower, and a keenly-priced replication of the Mercedes CLS, and yet it's built on the same wheelbase as the donor model. VW describes it as 'Comfort Coupe' which is stretching the truth, 'cause it's obviously a four-door sedan. The ‘halo’ version is the 3.0L V6 with all-wheel-drive, but the majority of the cars sold in the USA had the 2.0L turbocharged four cylinder, mated to a six-speed Tiptronic, and that was my test car. Driving through the hills south and east of San Francisco the CC handles beautifully, and the combination of the turbo four and the Tiptronic allowed very energetic driving on the twisty Skyline Drive. However, when you need to stretch the CC for overtaking, the four cylinder engine gets a bit breathless. Having said that, around town the car is docile, easy to drive, and it’s sure to grab attention, thanks to the styling. There’s no doubt now that VW Group Chairman Dr. Piech is the reigning king of the platform-sharing concept, and I’m impressed the way the Volkswagen Group shares not only platforms, but powertrains as well. Classy CC sheetmetal contrasts sharply with a rusty hulk. The fit and finish is exemplary, but that's how VW justifies its premium pricing model. What amazes car designers the world over is the 'bravery' and audacity of VW Group designers, with the demands they place on the designers of the metal stamping tools to put a complex fender into production. It's one thing to design it in a concept car, but it's another to 'churn them out' from mass-production tooling. 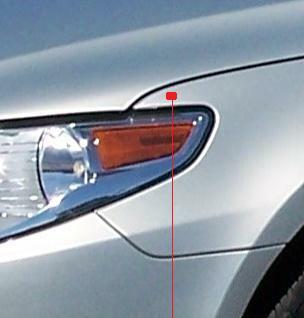 This close up of the front fender on the Passat CC is a good example. I have marked a section of the fender which features a very complex demand on tool designers, which ensures perfect 'stamping quality' every time the fender is pressed in the tool. This was pioneered by VW with the Phaeton luxury sedan, but is seen more and more on other models.